Countryside Wreath and Prairie Pines are two of the first four single patterns that started the Thimbleberries pattern collection some 27 years ago. They remained in the collection until the Thimbleberries Studio closed a few years ago. Many of you may have made one of these (or both) quilts. 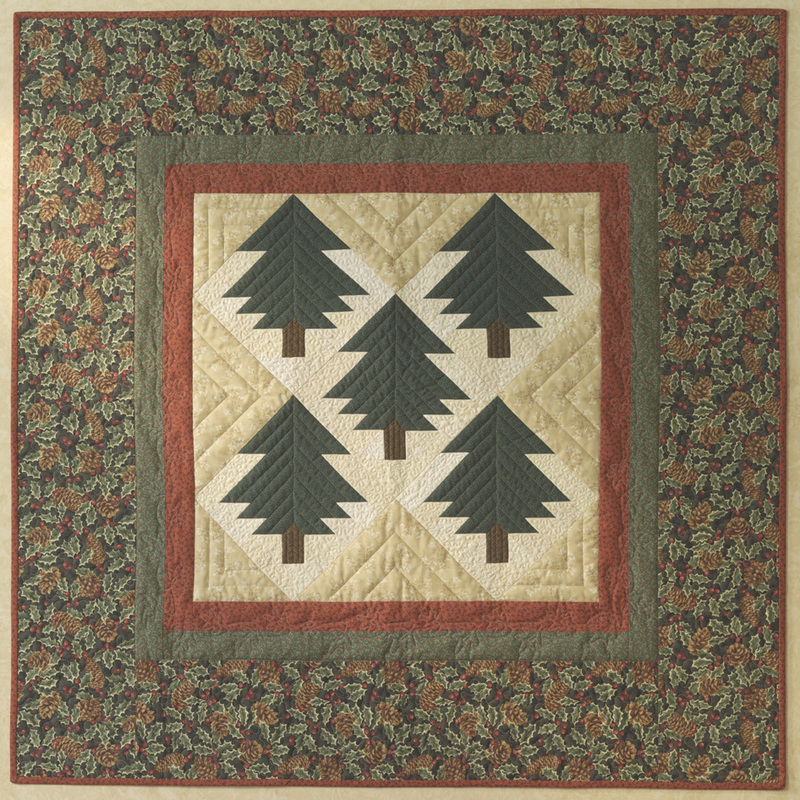 The original Prairie Pines quilt was larger and made to look like a scrap quilt. Check out the Reminiscing section for more Thimbleberries memories. Both patterns are still available in my book, In Celebration of Quilting from Landauer Publishing. FREE PATTERNS from the past . . . Just keep scrolling! West Wind Throw… this is a great pattern for scraps you have in your stash. 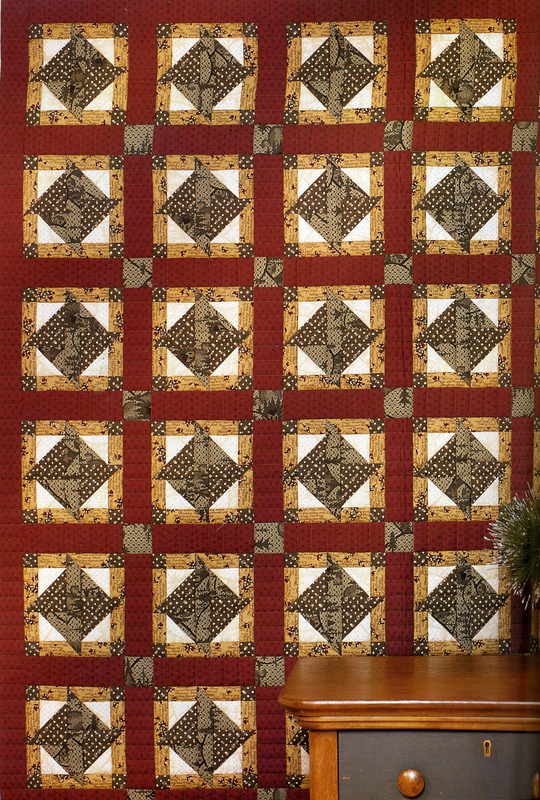 Combine with other quilts in your collection for a fresh look throughout the year. From my book Easy Living Quilts. 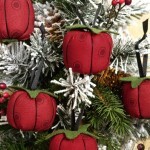 Tomato Pincushions… you know, the iconic tomato pincushion we all remember from our childhood. They’re a perfect gift that can be given to friends for a small Christmas favor. 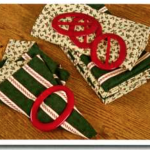 Pine Sachet Bundles are a perfect scrap project. I use dried balsam needles in these bundles and put them in my mitten and scarf drawers, and also our coat closet. Bar Code Runner can be made in just minutes! Make it in many combinations to use throughout the year. It is also perfect for a lovely housewarming gift. Combine with a bottle of wine or candles for an impressive gift. 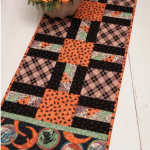 Pumpkin Patchwork Napkins from the book Cottage Comfort by Lynette Jensen for Laudauer Publishing. Bubble Woolie, from the book Thimbleberries Scrap Quilts by Lynette Jensen for Landauer Publishing. Looking Back . . . Growing a business is a lot like planting a garden. It all starts with a few tools and a handful of tiny seeds planted in the proper soil that offer the promise of big, beautiful blooms. If given the right amount of loving care along the way, a carefully cultivated garden can be a work of art and afford lasting pleasure. So it is with a business that begins as a mere vision and with great attention to detail, blossoms into an established brand. For me, inspirations for designs have come from collecting everything from the unique to the ordinary. 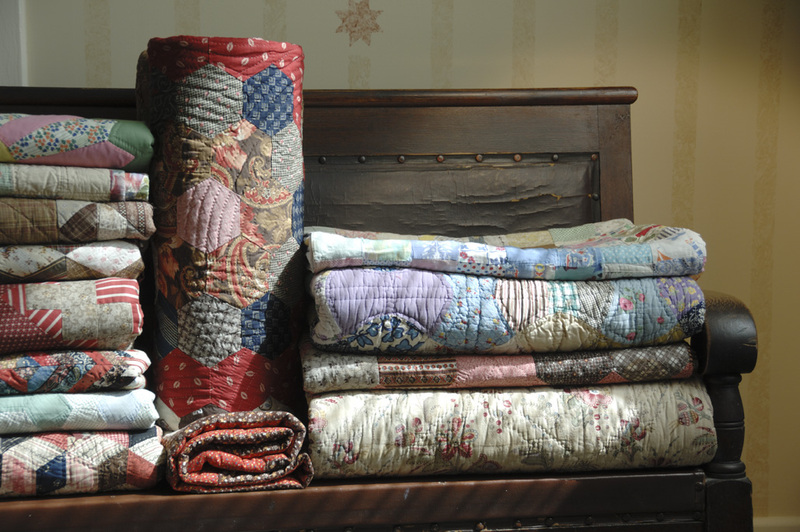 My antique quilt collection has played a key role in my business. I quickly transition beyond collecting quilts to quilt making and teaching others and in doing so, discovered I loved the world of designing quilt projects and quilting fabric. I’ve had a good amount of time recently to reflect on my career and realize how lucky I have been to be able to turn a love of a craft into a successful career that lasted over 25 years. And now, I have the opportunity to step back in and work with people that I respect with which I have so much in common. Generally, every one of my collections started with a family piece or a family memory. 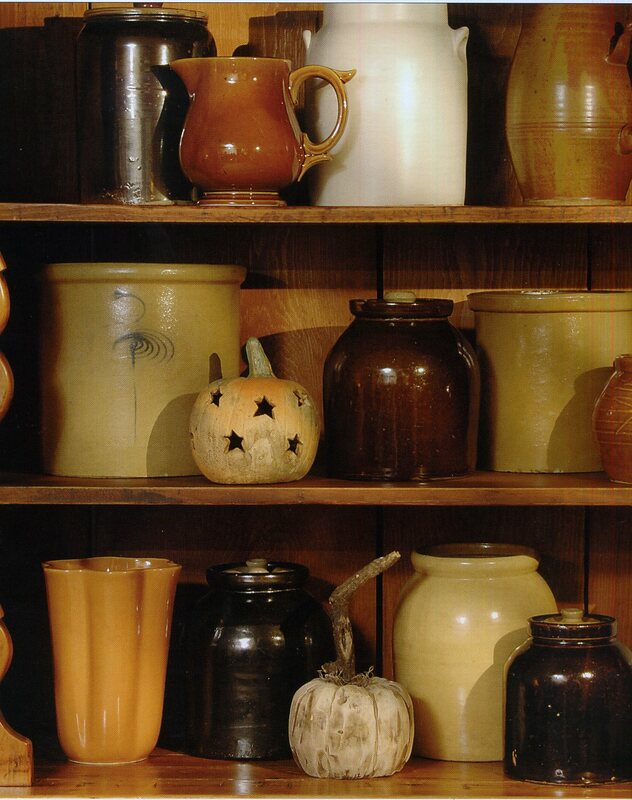 The variety of textures, colors, shapes and added benefit of being quite utilitarian have given pottery an important place in my home and heart. When I see the pretty bowls and brown pottery jars I’m fondly reminded of my grandmother’s special one that always held apple butter. Vintage tin food containers and picnic baskets are constant reminders of a time when society was not based on everything being disposable. 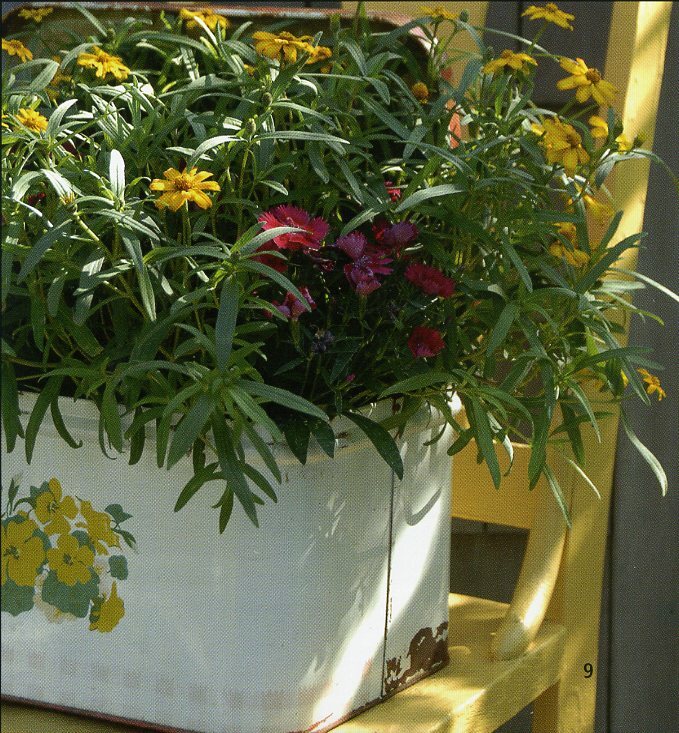 Even rusty tin picnic baskets artfully spend their final years serving as planters in my garden. 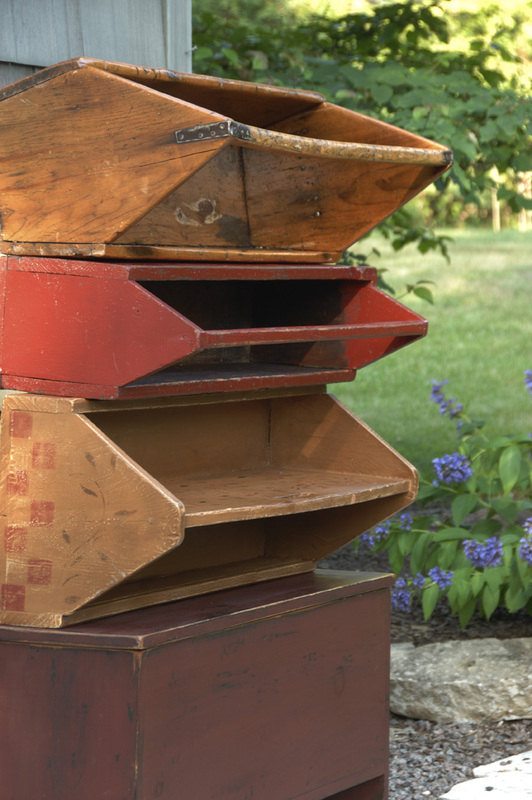 One of the challenges when collecting is finding new uses for old things or a new way to display them so the collection makes an artful statement. Gathering many of the same items together will make them look special. Photos from In Celebration of Quilting – 20 Years of My Best by Lynette Jensen for Laudauer Publishing. Looking back to my first fabric collection, Buttermilk Prints, to the present designs I am working on now, it is interesting to see the huge variety of collections that have come and gone. There have been spring and fall collections, Halloween and Christmas collections, children’s groups, flannels, woven plaids, novelties and panel prints. 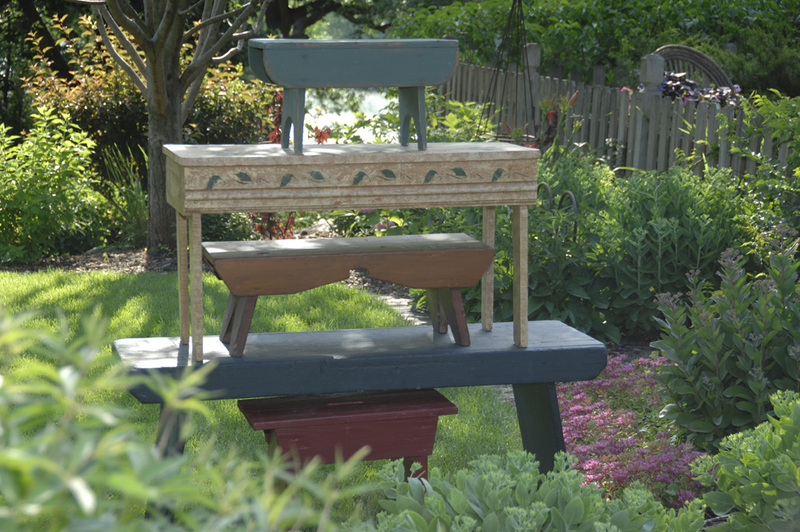 The challenge was always to design something different yet, maintain the Thimbleberries style. Many of you have stashes of Thimbleberries fabrics much larger than mine. In general, I kept very little fabric, but I did keep favorite quilts that showcased the various collections. I am often asked what have I done with all the quilts that were made for book and pattern publications. Once my staff and I tried to calculate the number of quilts made at the studio and we are certain well over a thousand samples were produced over the 25 plus years. Obviously, I have not kept them all. There have been a few charitable events that benefited from my collection. Three in particular stand out. Years back, I became involved with Habitat for Humanity. The governors wives from each state in the US sponsored a “build”. I sent off quilts to all fifty states. The quilts were to be presented to the new home owner by the first lady of state. All were distributed and those who organized this effort put together a scrapbook of all the heart warming letters and pictures of the families that received the quilts. Quilts have also been given to local Habitat for Humanity homes as well. I always feel that every home should have a quilt to love. Our local Historical Society is renovating the first home built in our town and the committee is always looking for fundraising possibilities. I donated quilts for an auction that raised $10,000 for their efforts going forward. On a brisk October day, the quilts were hung on clotheslines stretched from tree to tree on the property of the historic house for people to view before the auction. It was quite a glorious sight. Along with these two groups, Faith’s Lodge was the recipient of countless quilts to fill the Thimbleberries Quilt Cupboard. Faith’s Lodge Is a retreat home in upper Wisconsin that is available for families to grieve and heal from unexpected birth outcomes. Each family was given a new quilt to take home as a reminder that others cared about their loss during this time of healing. Many Thimbleberries fans from all over the country also made quilts to send off to Faith’s Lodge. Pictured below are some of my favorite quilts from the book New Collection of Classic Quilts by Lynette Jensen for Landauer Corporation. Up North, page 94, Goldenrod Patch, page 178, Block Party, page 172, Winter Bright Throw, page 160. These are among the quilts that have been donated to charities over the years. I am looking for the baby barn quilt pattern. I found one very similar to the one I;m looking for, Can you help? Sorry, that is not a Thimbleberries design…can’t help you out. I am trying to find the blue fern fabric from the Home again Line by RJR for Thimbleberries. Can you tell me where i might find some of the fabric?? I am so sorry, but I don’t have any resources for you. I think that line sold out quickly but of course some might still remain on quilt store shelves, but I would have no way of knowing where. Maybe some of my blog readers will have some hints. Sorry, that panel sold out and I don’t have a resource for them. 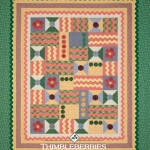 Do you still have the thimble berries quilt club? No, unfortunately all that stopped when I closed the Thimbleberries Design Studio. I am missing a block from one of your block of the month quilts. Any way to at least get the pattern? I have enough fabrics from the other blocks. Thanks! I guess I am not sure which quilt you are referring to…there were so many over the years. In catching up on my collection of stash over the years I returned to your book ‘Thimbleberries Guide for Weekend Quilters’. 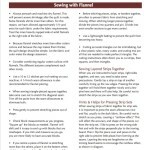 I am interested in doing the quilt design from the Quilting Design Diagram (p.35)for the finishing of My Favorite Things quilt. Is there a template available for the scrolling border and the cornerstone block flower? Thanks ever so much. Thimbleberries has always been so close to my heart and I am glad you are ‘back in the business’!! That book was completed so long ago that I no longer have notes on any of those kind of details. I am certain you will be able to find one similar that will finish off your quilt nicely. I’m looking for a pattern which had wonky stars set in nine patch blocks. The stars were in two sizes, as I recall. What was the name of the pattern and do you remember in which book it was? I am quite sure I never published a pattern with wonky stars in a nine patch block design. Sorry, I can’t help. Sorry Kathie, I no longer have any of those patterns. Hi Lynette i am trying to find a pattern that was a block of the month by thinmbleberries that has embroidered woodland critters its just beautiful but dont know the actual name but hoping you might be ablecto help me locate a copy i can buy. Cheers Sandy. The only Block of the Month that Thimbleberries published was Vintage Stitches and it had a few animals like a bunny for a spring block and a turkey for November, but they were not woodland. All those patterns were sold out and that quilt is not is any other book…sorry, if that is the one you were looking for this week. The Garden Charm quilt was an exclusive project I did for Craftsy and that is the only place it was made available. After many years I am trying to finish my Thimbleberries Quilt Club 2004 Basket Case Quilt. All is finished except for the block for April & May. I have the fabric, but have lost the instructions! Please help. Where could I obtain a copy of these instructions? Thank you so much. Sorry, I no longer have any of those patterns. The pattern for that whole quilt is in the book, Beautiful Blocks for Beautiful Quilts and is now titled, The Basket Sampler. I recently picked up my Village Green quilt to assemble the blocks and found I am missing the instruction booklet 11 for the half square border. Is there anyone that has a copy I can purchase or borrow? I have a purchased queen size border waiting for me that I am dying to complete! Hello. I have recently taken up quilting and I found your book, Thimbleberries Big Book of Quilt Blocks at a library discard sale for a dollar. I instantly fell in love with your designs. I am taking sewing classes and working on a simple bear track quilt for a gift. However, I bought some fabric squares on sale with the intent of attempting to do blocks 1 and 7 of your year quilt. In the last three days, I have come home from work and unwound by making blocks 1,2 and 7 of your year quilt. Your blocks are addictive, your designs are beautiful and timeless and I got so excited I ordered two more of your books from Amazon.com. I just wanted to let you know you have a new fan and even though your Thimbleberries cloth is no longer available, your designs are so universal that I was able to create the blocks with no problems. I am eagerly awaiting delivery of the two books to see more of your designs and projects. What a nice note to wake up to this morning. I am happy you have found Thimbleberries books to get you started in the this wonderful heritage craft. My patterns have started countless quilters down this path. I think you will find our instructions will create a sound understanding of the skills needed and will give you confidence to move on to other skills. I have always felt that simple, straight forward designs executed in great fabrics make the best quilts. Enjoy your journey…it is a fun world to join. Many of my books can be found at landauerpub.com. I recently inherited a 2005 Thimbleberries Vintage Stitches kit. The blocks were all embroidered and the block materials put in bags by the month, but none had the instructions. How could I get a copy of the instructions so I may put this quilt together. The colors are so pretty and the finishing this quilt is very important to me. When I closed the Thimbleberries Studio, I didn’t keep any of the detailed information on older projects. 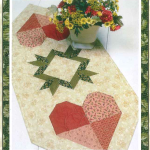 However, that quilt was featured in the book, Big Book of Quilt Blocks by Lynette Jensen. Perhaps you have that book or it might be found on an internet search. You could also check with landauerpub.com. Sorry I couldn’t help. Jane Horner I have that book if you still need info I’d be glad to help you. Hi! Am finally making the Stars and Chains quilt from your book Blue Skies. Found I am short the Paint Box 2000 Blowing Leaves Cream on Cream background fabric as I am making it larger than originally specified. Would love to find 3 yards of this fabric. Any thoughts? That fabric of course is no longer available. However, any cream background fabric will work..just mix up the blocks a bit when combining into the quilt top. It will be great. Wow…looking for fabric that was released 17 years ago…you are very optimistic. I have no leads for you on that one. But I do know that mixing up similar tones of background fabrics always works in a quilt and sometimes even makes it more interesting I know for certain it would work on this quilt…one of my all time favorites, by the way. Dear Lynette, Years ago I made a quilted jacket with a shawl collar and pockets. I am 99 percent sure it was a Thimbleberries pattern since I had to tell everyone where I got the pattern. I want very much to make another one but cannot find my pattern, nor can I find it on line anywhere. Can you Help? Sorry, I don’t have any older patterns in stock after closing the Thimbleberries Studio. I don’t remember ours having a shawl collar. Good afternoon – I was lucky to find some old Thimbleberry flannels at a yard sale and am considering your Pine Ridge quilt from the At Home With Thimbleberries book. My question is about making it in a queen size instead of twin. 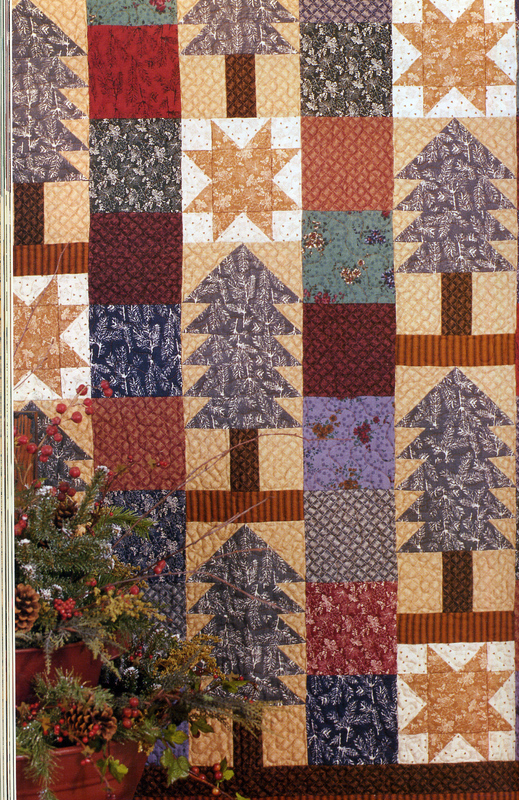 If the patchwork center were made larger by adding more 81/2″ blocks would the trees and star blocks still be the same sizes- 81/2 x 20? I have EQ7 but would surely struggle with the process. Thank you! Yes, you would just need more of them. I think graph paper is a much easier route to go when figuring out a new size. You will easily see that the 8-1/2″ blocks line up nicely. This quilt is included in my new book, Quilts with a New Attitude published by Landauer Publishing and can be purchased from landauerpub.com. In the book both the throw and a king version is included as well as a picture of a queen done in red and green fabrics just to show how adaptable it is. looking for Thimbleberries Village “Sunshine” block 9 – anyone out there have it or know where I can get it? That one is in the Thimbleberries: Big book of Quilt Blocks. Have you found the block info? I have the book, I’ll copy that block for you. Lynette, I have attempted to contact your publisher of the Thimbleberries for Weekend Quilters, Rodale Press, to see if we may donate a quilt made from a pattern in that book to the American Cancer Society, our local branch, as a fundraiser. We presume they would raffle it off. Rodale answered within a day and sent me a contact for the agent who handles this sort of thing for them, but my email has not been answered, and his phone rings and rings, but is not answered. Is permission for this to come from the publisher, or from you? I think it is safe to say I own the copyright on the design and you have my permission to raffle off the quilt you have made. Good luck on the raffle. Hi Lynette, I have the book Lake Life and many of the fabrics to make these quilts however I am looking for 1 yard of the The Black print, it has swirls on it like black on black. Same as the Beige print if that helps. Love these prints and the patterns are adorable. Making it for the family lake home. I know this is an older book and print but thought it may have come back around as fabrics often do. I remember the fabric and it was a great black. However, I do not have back stock of fabric and no resource for you. Perhaps another reader will spot this and can help you out. Sorry, that fabric is long gone. As a matter of fact, Block of the Month fabric often sold out the year it was issued because of the popularity of the program. I am sure you can find others to substitute and for sure there might be enough scraps from other parts of the quilt you could use. The whole quilt design was meant to be a scrappy look that it will be easy to blend in fabrics other than those initially designated. Even the faux appliqué blocks are small enough that other fabric could be substituted. Sorry, I don’t remember every publishing a pattern by that name. I have done an exhausted search for that title in my notes on past patterns and publications and don’t find it either. Sometimes stores would kit a pattern (not mine) but use Thimbleberries fabrics in the kit and the assumption was made by the consumer that I had designed the pattern as well. In any case, I can’t help you out right now. Hi Lynette..so excited on this snowy day to discover your blogs. I have spent a lot of time scrolling through and reminicing about all the projects, clubs, home tours and visits to your studio In past years and so glad to have a chance to connect again and be inspired..thanks goodness I have a stash of past fabric collections to fall back on.. I purchased the kit for Pansy Park, washed all my fabric and was ready to start, then I had to move. Somehow in my move the fabric and patterns got separated. I have all the fabrics but no pattern. Where can I get the patterns for all the blocks of Pansy Park? I found them. I have ordered the Big Book of Blocks…yeah now I can make the quilt. My next issue is that I have the 20/08 Thimbleberries Celebrate Box and haven’t a clue what I should make using all this great fabric. Any suggestions? Those cut sizes in that box are not specific to a particular project. I think it is best to treat them as a fabulous treasure trove of well coordinate scraps for many seasons. I do love the box they were packaged in. I keep mine filled with wool projects that I can easily access to pick up whenever I want to do a little amount of stitching without having to organized a project. The box is so good looking that I don’t mind having it out and visible. It is almost an decorative accessory. The patterns are obviously no longer available after this much time that has passed. The series was published in 2002. I have only my archive packet and have vowed to keep it and not sell it off. The retail value is $36 so well worth looking for in your books and patterns. The group may also be available on eBay. 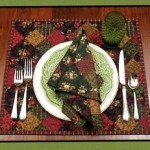 I have heard many quilters find past Thimbleberries products on that sight. Another option is to use other assorted 12 in blocks using the block fabrics and bordering it with the border fabrics as you would any other quilt. You would then get a very similar look to the original design. Sorry, I don’t have any but someone else who reads this might. If not available may I have your permission to copy the above? No, it is no longer available and you may copy the pattern. 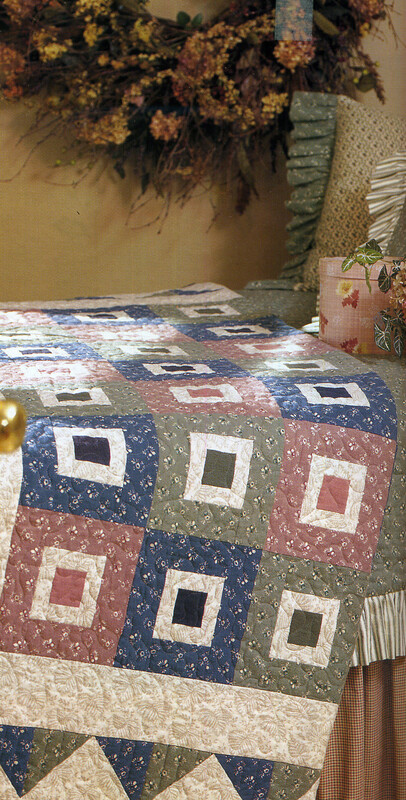 I started quilting when I retired and purchased several Thimbleberries items from an estate. I especially loved a project called SAFE HAVEN PATTERN SERIES. I am finding missing pattern blocks and fabrics and would like to complete the entire project. I found a quilt shop with fabric by Thimbleberries…now I need to find the patterns. Do you have any idea where I could find this wonderful series. The finished quilt is 88″ x 96″. Thank you for all your wonderful patterns, projects and ideas. 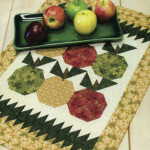 The individual Block of the Month patterns are sold out but it was published in a book titled Big Book of Quilt Blocks. I am not sure were that might be available, but perhaps a search on the internet might give you some resources. If not, just repeat a house block in different fabrics. It will work out just fine. Katey, I have the book that has the Safe Haven patterns if your still looking. 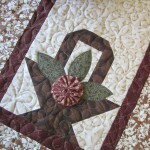 Looking for monthly patterns for 2004 Thimbleberries Quilt Club. Specifically March through December (have Jan and Feb). I have all the fabric, and the color reference guide. After years of being too busy, I’ve decided it’s time to tackle some unfinished projects, but can’t locate my instructions. I’m hoping someone out there might have information where I might find these. I too am working on Thimbleberries UFO’s. i probably have all of 2004 but have not sorted through all of it yet. July and August are intact. If it’s ok with Lynette, I will email to you. By all means…please help Cheryl out as I do not have past items like that available any longer. When I closed the studio I really did dispose of most things. I have all instructions for 2004’s Basket Case quilt. (Didn’t care for that one so I didn’t make it.) My binder also seems to have 2003 and 2005 too. Post your email and I will send on. Can you please email me the pattern for the Basket Case quilt? I am trying to catch up on past kits. I am missing most of the months, only have Oct, Dec and July. I would really appreciate it. Sorry, I don’t have those patterns any longer. The pattern for that quilt is in Beautiful Blocks for Beautiful Quilts and it is titled, The Basket Sampler. 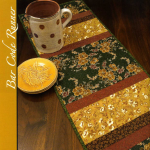 Linda – do you have the patterns for Sunrise and Sunset from the 2005 quilt club? Desperately need a couple of yards of Pansy Park border. My kit was VERY short, and years later, I’m looking for discontinued fabric. No luck on Ebay or Etsy. Any suggestions? I am sorry, I don’t have any resources for old fabric lines. Perhaps one of the subscribers to my blog will have a suggestion. 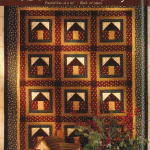 I am looking for the pattern for Thimbleberries Lodge quilt from 2008 if anyone can help I would appreciate it. 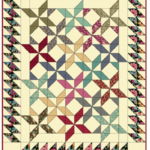 I’m looking for the fabric you used on the Autumn Star Shine quilt that I saw on Fons & Porter not too long ago. I’m still waiting for The Love of Quilting magazine that has the pattern but would like to purchase fabric if its still available. Love your quilt patterns because they are so easy to follow and I’m just getting started quilting. Recently, Quilt Haven on Main, still had some Autumn Landscape left. Call them at 888-843-8215. They are very good at helping quilters find good substitutions if the fabric is sold out. Thanks. Hi Lynette…. I received a block of the month set you designed! I love it ! unfortunately I’m missing Blocks 2 and 10 of the Village Green pattern series…. Would you be able to help me complete this set! Thank You! I will dig in my archives and get back to you. I found block 2 and 10 patterns for you from the Village Green quilt. If you are interested, send $12 to Lynette Jensen, 415 Washington Ave. W, Hutchinson, MN 55350. This includes free shipping in the US. What year did the Village Green Pattern come out??? Village Green was the Block of the Month in 2010. I never finished putting my Village Green quilt together. Started going through what I’ve done and found that I do not have the #17 border for the queen size dusk. Help!!!! So sorry, that fabric is no longer available. The Village Green collection is from many, many years ago. I am sure you will be able to find a suitable substitute. Thanks so much for your reply. I found my #17 fabric, thanks to St Anthony. I have block instructions 1-11—-but it says there is 12. Can you help with 12? and all the borders, please?? HELP!!!! Remind me again which quilt you are making…fabric#17 and block 12 are not enough of a hint for me to recall. I have completed my Village Green quilt!!!! Wahoo!!!! Never did find the month 12 instructions, but found some finished examples from Pinterest and Etsy. So with a lot of patience, seam ripper, and creativity, and prayers, my quilt finished out at 89×100. I am so proud of myself. Now it’s time to pin it on my longarm and bind it! Wahlah!!! I need 1 yard of lake house quilt fabric 6920-2 the cream green leaf print to finish my quilt could you direct me to someone who might still have this. Sorry, I don’t have access or contacts for past fabric collections. Perhaps a substitution will work just find…it so often does. I was lucky enough to get some homemade caramels from a friend a few years back and she put cinnamon oil in them they sure were yummy. Just thought I would share. Hello, I’m looking for a panel called “Lake Life”. I know it’s out of production bu tI was wondering if you have a couple panels around. I would take a couple 2-3 panels. Do you know of anyone who would have this panel? So sorry, I don’t have any and I do not have a resource for you. That collection sold out quickly. Have your searched on eBay? a few years back -when you were a member of the club, you received a free project each month. this year you were doing tea towels, I received all of them but the last one -December. could you please send a copy by e- mail if you can .thanks so much. I am sorry, I don’t have copies of those projects any longer. I used cookie cutter shapes, so perhaps you could find a cookie cutter that would work for December. I purchased Safe Haven block of the month at a yard sale. I thought it was complete. However as I am finding I am missing block 5. Is there any way I could get the pattern for this block? I realize I will not be able to get the kit but I should be able to get fabric in the color way if I have the pattern. Thanks in advance for your help. I am so sorry, I do not have any pattern sets left to rob from and the files no longer exist to reproduce. I suggest you just repeat one of the other similar size blocks in different colors and prints. I guarantee you know one will pick up on the repeat block, and if they do they will think it was meant to be. Jean, these patterns are in the Big Book of Quilt blocks. Use the patterns you have to select colors. I have this set, and I will be construct bock 5 in a few weeks. Do you still need instructions? I met you several times in your shop/studio and at the holiday retreat at the seminary in St. Paul. Early on there was a pattern for a tree skirt called Midnight Star. I did the pattern often years ago, however, we moved from Glenview, IL to Sturgeon Bay, WI and I don’t know if some of my quilt books or patterns were misplaced or if I’m just getting old and can’t find it. Could you please tell me the name of the book it was in or how to get that pattern again. My great niece has all my rustic handmade ornaments and I would like to make her a tree skirt to go with them. Thank you so much and Merry Christmas! My husband still chuckles at how much fun he had at the seminar he attended with me. 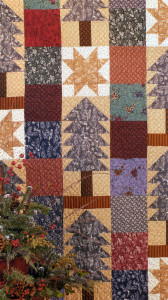 Midnight Star Tree Skirt was in the Thimbleberries Holiday Collection published in 2000. It, of course, has long been out of print and sold out. Perhaps a fellow quilter you know can locate it for you to use again. It was a great project, and pretty easy if I recall. We made a number of them without the appliqué and in other fabrics for table toppers. I hope you can find it…Happy Holidays. 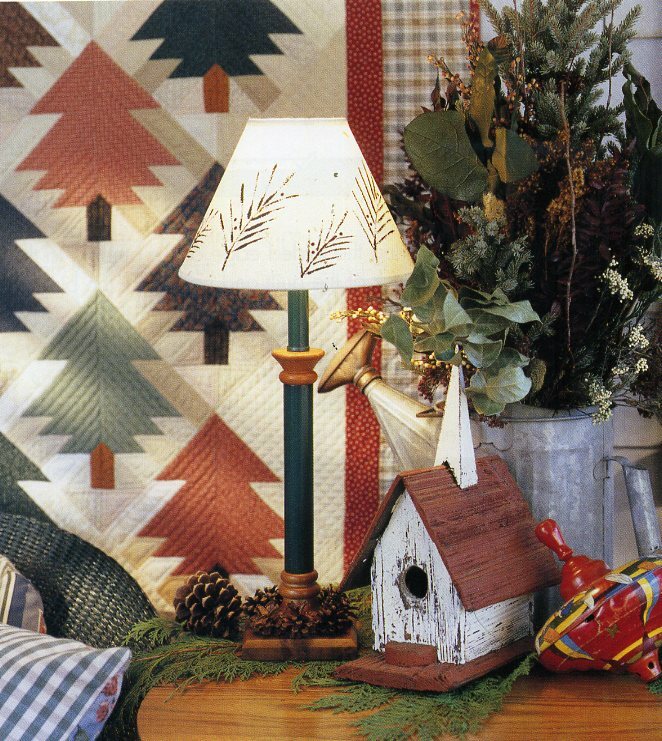 Is the “Countryside Wreath” pattern still in print? (L J 9227) My guild in St George, UT, is considering a holiday workshop for next Fall. It is still available in the book, In Celebration of Quilting. You perhaps have that book. If not it is still available from Landauer Corporation at landauerpub.com. It is such a classic design and one of my first. HELP! A LONG time ago, I purchased The 2007 Thimbleberries Club kit House & Garden big club quilt and the instructions/pattern for MARCH is missing. Can you send me in the right direction find it? THANK YOU!! I am sorry, I don’t have any of those instructions any longer. I have completely depleted by stash from 9 years ago. Perhaps someone who reads this blog can help you out. I have all of my 2007 Thimbleberries Club info. March 2007 was a table runner using the January and February blocks. I also have the instructions on putting it all together. Can upload a photo somewhere. hi Lynette, i was a Thimbleberries club member and purchased a bom quilt kit in 2004/2005 it was a sunshine/shadow in the dark colorway. i was having some personal issues at the time and was not able to attend meetings. my “kit” was held for me to pick up when i could come in. Somehow i never received block 4 of the sunshine quilt. By any chance do you have a picture (from the cover of the book) of that block I have extra fabric but I don’t know what the block looked like. Thanks for any help you can give Leah, Meridian, Ms. I do not have any of those material any longer…that was a while back and the pattern booklet sold out. What you can do, is repeat one of the other blocks or a similar 12″ in the fabrics you have and believe me, it will blend in and look great. Many others have had to take this route when instructions have been misplaced. I hope this finds you well! I have searched high and low for a quilt pattern of yours and cannot find it. The pattern is what I would call a sampler pattern and contains four houses, “sunflowers” under one of the houses, several blocks with flying geese, blocks that include a snowball pattern, and three large star blocks at the top/right of the quilt. Any idea of what the name of the pattern is? If the pattern is in a book, which book? I would include a picture of a completed quilt if I was able to do so. I have always loved your fabric and enjoyed working with your patterns. That just isn’t ringing a bell with me. I have looked through my archive list and don’t see anything with 4 houses and sunflowers. So often, people think a pattern was mine and it wasn’t, but perhaps was made in my fabrics or just my style. Sorry, I can’t place it. I purchased all of the Lake Life fabric 2012 to make a queen size quilt, but I have lost the quilt pattern. This gorgeous, dimensional looking quilt pattern was published in a magazine – and I cannot remember the name of the magazine. 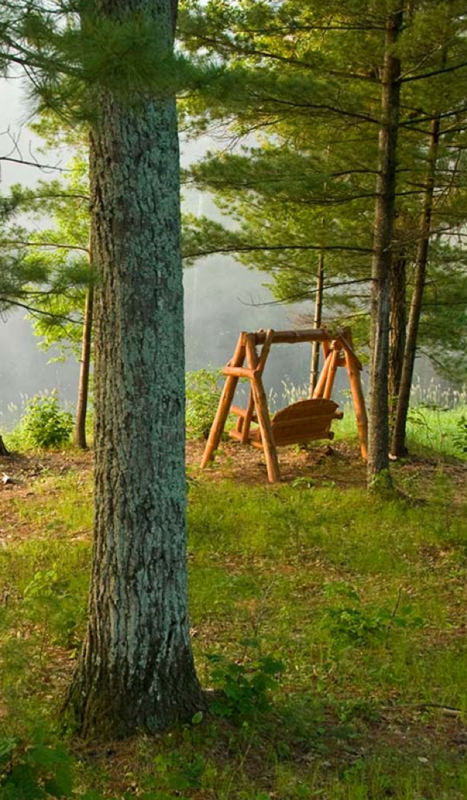 My daughter purchased a cabin and this is the perfect gift….any help would be appreciated. There are a couple different patterns for the Lake Life line. They are e-patterns on http://landauerpub.com/Thimbleberries/. I hope this helps! One of them I love. Very pretty and perfect for a cabin! These patterns of course, only work if you have the Lake Life fabric collection with those iconic images. If you do, I still have a few copies of the Lake Life book with all of the patterns in it. You can send me a check for $18.00 and I can send a copy off to you. Make sure I have your mailing address. 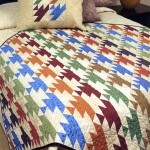 I have those quilts from that book the beds at my cabin as well and love the throw sizes too. I’ve been trying to find the tree of life pattern. Someone on facebook Quilt Along with Pat Sloan thought it was a Thimbleberries pattern? Is it??? Sorry, it is not my pattern and have no idea where to send you. It is impossible for me to rewrite directions for all the possible sizes of quilts so suggest you make the quilt as publication has given. If you need fabrics for it, you can contact Quilt Haven on Main at 888-843-8215. They will be able to help you. I do think, as a beginner, you should start with a small project to gain skill and confidence so that you can move onto larger, more difficult projects so you enjoy the craft and become an avid quilter. I just got your Oh So Cozy Flannel Quilt book and was wondering if any of your patterns are pre-cut friendly – charm, jellyroll ,etc. 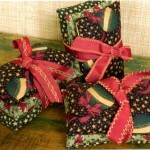 I have several packs of flannel charm packs and just love your patterns. Lynette, I smiled when I read your post that included Buttermilk Prints. I still have some of those fabrics (in yardage) and I cherish them. I have many of the fabrics from your early quilts, in fat quarters and yardage and I always told myself that someday I’ll make a quilt with them, but I haven’t found the right one yet. I was thinking of designing one with all of them included. Maybe a Virginia Reel with one background fabric to tie them all together. You’ve been an inspiration to me and I’ve always enjoyed working with your fabrics and your quilt designs. Thank you for stepping out and using your talent and skill to benefit all of us. I can’t believe you still have the Buttermilk Prints….that was a long, long time ago. A lot of stitching has “gone under the bridge” since then. I have two new quilts to bind today. I am getting ready for Fall Market in Houston. The new collection that we will be featuring is called “River Song”. It actually has some of those original Buttermilk colors in the collection. I’ve been trying to find the tree of life pattern. Someone on facebook Quilt Along with Pat Sloan thought it was a Thimbleberries pattern? Which book was the Barcode runner in? That runner was in the Autumn Sunset book. It is just about time to get mine out for my table. I think I will do so tomorrow. Some years ago, you had a (I think) block of the month featuring Halloween motifs–may have been embroidered–where could I find the book or patterns for these? It wasn’t a Halloween quilt, but rather blocks that represented something each month, and a cat and jack-o-lanterns was the motif on the October block. The quilt was called, Vintage Stitches and involved a pre-printed panel for the blocks. The pattern to make them into a quilt has long been out of print. I here some people have found kits or fabrics for the quilt on eBay. I have no other resource for the pattern or the kit fabrics. Sorry. 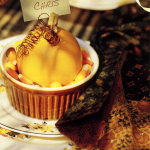 Thanks for your reply–would you have names of books or patterns for any other Halloween projects you had in the past? It’s one of my favorite Holidays! I had so many…too many to list. But the two books that have the most are Quilting for Harvest, and Quilting for Harvest II. I think you can still get them from Landauer, if you don’t already have them. I have these fabrics and the full pattern set if I could get permission here to share them. You certainly can share any items you are willing to do so. I would like to purchase your pattern for “A Little Sunshine” quilt. I have more fabric than I will be able to use (unless I make it to 110). I love the pattern and Craftsy suggested I ask you since they cannot sell me the pattern, only the Kit. Sorry, that pattern is not mine. I think the marketing director at RJR fabrics found other designers to make projects using Thimbleberries fabrics. I do not recognize that title and have not seen it on the Craftsy site. Sometimes all of the customer service people are versed on all the details of the projects, so if it used my fabrics they think it was a pattern from me. Sorry I can’t help. I am sorry, that is just too long ago. Those projects and fabrics sold out so quickly not to mention 6 years later. However, I have heard others find things on eBay…much like an estate sale. Perhaps month 12 was just assembly and border. The picture on the other patterns would certainly guide you enough to finish. Have you read through all of the patterns? You may have what you need. Another thought: since Thimbleberries fabrics coordinate so well, can you insert another, more narrow, border? I often stretch the width of my quilts as I tend to quilt them to death and wash them, and that extra border has saved me many times as it helps cover the thicker mattress. You certainly could do that. Any number of border widths would work. I have successfully made one of Thimbleberries’ BOM quilt larger by adding 6″ to the outside deep and dense green floral colored fabric on three sides so my “Pansy Park” quilt would be longer and wider to cover a very long drop on my bed. Ist my favorite quilt and it gets lots of “oohs” and “aahs” when guests see it. I am so happy you are pleased with your Pansy Park quilt. It is a classic beauty. Hello, I have two thimbleberries kits that I have no idea when or where I purchased them, I’m sure many, many years ago. 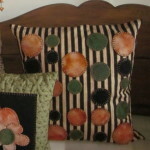 The pattern names are “Autumn Splender” & The Great Pumpkin” & both are from “the book Autumn Glory”. 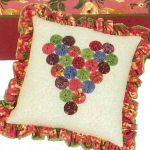 Could you tell me if these patterns are in your “Autumn Glory” book? I appreciate your help as I love the kits, your fabrics & your patterns! Both of those quilt patterns are from the book, Autumn Glory. Hope this helps. You can send the picture to lynette@thimbleberries.com. Are you able to scan the picture and email to me or give me a detailed description. I don’t have old copies of Fons and Porter magazines to reference. Was it an article that had many quilts in it? It might also help to describe how it was displayed. I’m glad to see your blog. Years ago I had the Prairie Pines pattern; my friend saw me with it in my hand at a quilt shop. She loved it and asked if I was buying it? No, I thought I had one at home. She was delighted. At home, I couldn’t find my copy. Never have. Wish I bought the one in that quilt store! I doubt she ever made the quilt anyway. Glad to see you making quilts again and helping out those who love them. You know, Prairie Pines was my first pattern and it was in my pattern collection for almost 20 years. Obviously a good one to start out with way back then. It is in the book, In Celebration of Quilting now. You may have that book. It is still available from Landauer.com. I guess it has become a standard and still one of my favorites for many reasons. Thanks for checking in. It is really hard to find older Thimbleberries fabrics and I don’t have a source for them either. But you could call my local quilt shop. I know they can help you out with anything you need (but not old fabric). I have many neutrals now available that I know you could use and they will be able to pick something out that would certainly work for backing for your two quilts. The neutrals are however, 44-45″ width and not 108″. I know they do carry wide backing from other manufacturers if you would like that. A friend of mine is looking for Thimbleberries fabric from 2008-(A Gardener’s Touch). I have checked e-bay and local quilt shops. No one seems to have Thimbleberries fabric from that long ago. Where do I tell her to look? I unfortunately have no answer for this one. Older Thimbleberries fabrics are almost impossible to find. E-by really is your best chance. Sorry, I couldn’t be of more help. Even I don’t have any in my stash. Cream anywhere – do you have any suggestions? Thanks! I assume you did not get the kit from Craftsy for the quilt…right? You could call my local quilt shop here in Hutchinson and order the fabric. They would be happy to help you out. They do not have the same fabric names as called for in the pattern so ask for the cream fabric, number 2654-004. Call Quilt Haven On Main at 888-843-8215 0r 329-587-8341 and tell them Lynette told you to call. Any chance you will sell just the pattern for the 2016 quilt on Craftsy? The Garden Charm quilt pattern is an exclusive project for Craftsy and they own the rights to it. I cannot legally release any content related to that project. I think the class is free to download and a kit purchase is not required. So you do have access to the instructions on a monthly basis if you would like to make it in your own fabric choice. 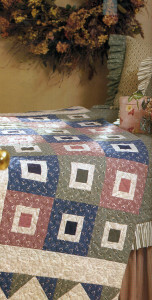 Hi Lynette, I own a quilt store in California that has been a huge supporter of your products for a very long time. We had a wonderfully large Thimbleberries club from the year we started business in 2001 until your retirement. I had some very sad customers who where very worried they would be lost without their Thimbleberries club meeting that we proudly hosted every month. We had a daytime club and a nighttime club. I could not wait to personally let each one of our club members know that you were coming out of retirement. Oh the excitement was wonderful. The excitement for me has turned to sadness. After so many years of supporting your club, fabrics, books and patterns it breaks my heart that you would sign exclusively to an online only store. I can not offer the product to those customers that have been so anxious about your return. Oh they can still get the product (good for you), but I can not supply it to them (bad for me). I am sure you made this decision based on your vision of online sales being the sign of the times, but it sure does hurt those of us that are struggling to keep our brick and mortar stores relevant. Thank you for “listening” Lynette. I hope I can address your concerns. When RJR coaxed me back into the world of fabric design, the intention was to do only that, meaning that I would not be going back to my former business model of self publishing patterns and books as well as fabric design. I am now part of their team and not as independent as before. They wanted me to design lines of traditional fabrics for that very strong segment that is still present in the quilt world, even thought we all know things are ever changing and challenging. My mission was to design groups that would be more transitional and less country. Since I retired and closed my studio, I did miss being connected to the quilt world, but knew it was time to cut back, travel less, and reduce the deadlines and schedules that increasingly became more demanding as Thimbleberries grew. When I turned in my first new line, Home Again, RJR suggested I respond to a request from Craftsy to submit a design for them, I too, had some concerns. However, I was convinced by others that since the fabric line is not exclusive to Craftsy and the lesson is free to those who want the pattern I felt it may not be much different than when I would design projects for all the industry magazines in the past. Your customers could sign up for the Garden Charm class (for free) and purchase the fabric from you and they could all get together to sew the quilt over a 6 month period. I know your customers are loyal to you because of your help, friendship and inspiration. They may enjoy doing this quilt with you at your store and you could use the opportunity to benefit from the class. I have am not committed to on-line shops only, but RJR and all other quilt businesses do recognize they are now a permanent part of the quilting landscape. 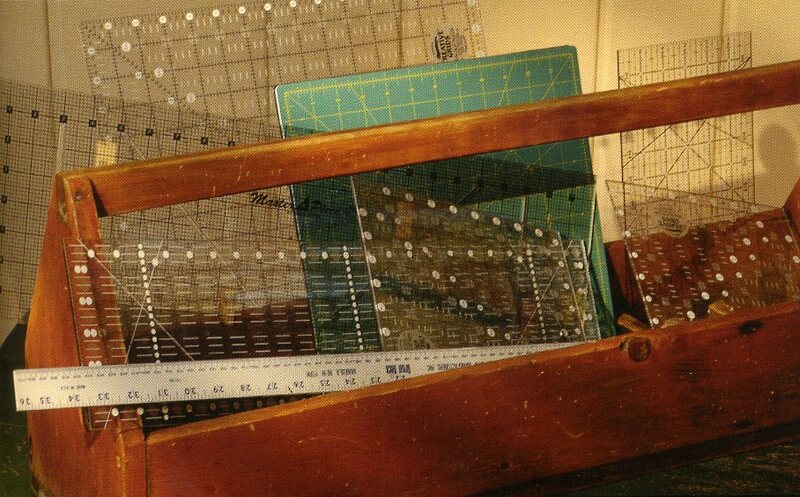 I am currently working on designing a BOM project for RJR that could be used in conjunction with Cotton and Steel to be available to quilt shops and appeal to a broader customer base. I am working closely with RJR to meet the needs of all of their customers. It is a different way of doing things for me, but I am pleased to have the chance to still be in touch with the quilting world for a little while longer. Thanks for all the support you have given me in the past and I hope there will be future opportunities to fit into your business plans. Do you know where I could find an old pattern of yours…can’t remember the name, but it was a pillow pattern with an interchangeable strip that went around a plain pillow, and it was a set of 4….snowman for winter, pumpkin for fall, flower for spring and watermelon for summer. I have a friend who would love to buy it!….I can’t seem to be able to locate mine, but I used it and loved it! Luckily, I know which pattern you are referring to…Seasonal Pillow Wraps. Unfortunately it has been out of print for years and years. Your friend might have some luck searching eBay for this item, especially now that you know the name of the pattern. Good luck to you two. You take a small tacking stitch right in the same position on the outside edge of the appliqué…very simple and very effective. I do that every few stitches on an outside curve like a circle and now and then on the straight sides of an applique and always on corners or points. I don’t think I have ever had a diagram because it is basically just a double stitch. Hope this helps. Gotcha! 🙂 Thank you so much for responding. Keep those good designs coming! 😉 Happy New Year. Welcome back! I have SO enjoyed your fabrics, patterns, and books and continue to enjoy them even throughout your hiatus from publishing (I have a huge stash and will never live long enough to get through it!) I want to thank you also for the wonderful french toast recipe in your Cottage Comfort book–whoa, seriously delicious! So glad you’re back–you’ve been missed! I remember that recipe. Time to pull it out again, especially this time of the year. I think you will like the egg bake recipe from the January 4th post. It too is a winner. I look through my older books often as well and reminded of the fun we had putting those books together. Thanks and stay tuned. Hi Lynette. I loved your fabrics and I still have a lot of them. I have a kit from the 2003 quilt club I am making for a wall hanging. I have the instructions but I only have a black and white picture. Would you check to see if you have a color picture you could email me? It is the winter scape quilt for club members only. Sorry, I don’t have any of those materials from that long ago. There is a good chance there wasn’t a illustration in color for the project. Back then, many of the club exclusives were in black and white only. I think the instructions will get you there, even without the color sheet. Sorry, I couldn’t help you out. This is exactly right…still involved with all of you and what we love, but at a different pace. It is nice to be back. I feel like I have struck gold. I am so happy to see you back. The first quilt I ever made was one of your patterns, a very easy one. I have used miles of your fabrics and lots and lots of your patterns. Your books were so wonderful..When I started quilting I thought as a quilt as a bed cover., thru your books I learned to decorate with quilts. Your style what I always wanted to achieve and you showed me how. So happy your back! Wow Gail…what nice comments. I am happy I have inspired you. Thanks. I am looking for enough patterns from one of your 2005 designs for our guild to make in March 2016…is there are archive of older patterns we can purchase them from? the Thimbleberries pattern inventory is very limited. I will be in touch. I am glad that you are back in the quilting field. Many years ago I took a class on making Christmas stockings. They had prairie points on the cuff. I can’t remember which of your books we used to make this project. I now have some kids that could use some new stockings to hang by the chimney with care…I hope you can help me remember which book it was in. Thank you so much, and welcome back. Press. They were a really popular stocking design and so fun to make. Hope you find your book. Happy Holidays. Thank you for taking the time to respond to my request. I did find the book, but there are so many beautiful projects I better get started soon. So happy to find you again! I miss Thimbleberries projects and the Club and the fabric. In fact I found a TBerries UFO, the 2005 Circle of Love Quilt in the ‘dark’ color wave. (I did finish the “Light and Bright” and it has been at my mom’s house for years now.) Will you be publishing any of these patterns? So far I can not locate my patterns and I do want to finish this quilt for my own use. I am sorry, I don’t have any patterns left from the Circle of Love Club year. Do you happen to remember the specific name of the quilt? lynette@thimbleberries.com and we can get more details nailed down. Bingo! It was the Sunrise and Sunset color wave, and I found my purple folder filled with what I needed. Only tore up two cabinets to do it. 🙂 Hopefully you will be able to reissue some of these patterns, and maybe set up a PDF download option and we can just obtain them. You have many fans and we’re finding you! Hope you can work out copyright and the legalities and put up some of your larger projects. I’m still kicking myself that I never splurged on Pansy Park! Oh, I am so excited I just came across this site. I lived the world of Thimbleberries for many years and was so sad when you left. I have accumulated a very large stash of Thimbleberries Fabric to use when I retire. I am now retiring on 2 Jan 16 after 40 plus years working for the Federal Government. I am looking forward to finally now using all of my Thimbleberries Books and fabric. I have done several patterns from your books already but there are so many more I plan on doing. I have patterns and the material for those patterns in draws waiting to be accomplished on top of my stash. So glad to see you back and your upcoming fabric lines. I am sorry, I don’t have any leads. I think that group is from 2008 and sold out that year. However, I know someone probably has some out there somewhere. The best chance is to go to eBay and search for those selling Thimbleberries fabric and specifically House and Garden. You just may get lucky and find the one you need. Good luck. The card with the pack just reads “Thimbleberries Pinwheel Runner – 18″x50”. There are 4 different fabrics plus the backing. — I’ve gone through most of my books and patterns but I cannot figure out which one to use. BTW, it’s great to have you back on board with quilting — I really enjoy your work and have previously participated in your blocks of the month program. Looking forward to the new quilts and fabrics!! Ok Nancy, now I think I understand the situation. You have a kit from a store that they named Pinwheel Runner. I really have no way of knowing which one they are referring to. I don’t recall a pinwheel runner of that size and to make matters worse, I had many runners with pinwheels in them, so that doesn’t help. I am afraid you may have to put that fabric in your stash and hopefully you will come across a runner someday that you will like. Sorry I couldn’t help….thought I would be able to, but just not enough information to identify which one. Good to hear it turned out. What a nice treat for your nice. I have the fabrics for Lynette’s pinwheel table runner but I cannot find the pattern! I have most of the books but cannot identify which pattern is use. Can anyone help? Thanks so much!! Which runner are you referring too? With a little more information I’m sure I can identify. When I started a quilting I asked for your books for Christmas. I still love them. I am so happy to see you back…I’ve been wondering where you have been? I took a class from you back in the 90’s in Nebraska. I planned a trip to visit a friend and take your class. I will try to find the pic we all took together. Welcome back…you will have a whole new audience, but your quilts are timeless and will fit right in with all the new quilters too! Treat yourself to more News and Notes from Lynette. Sign up for email notifications of new posts below.